Eleutherios was born in Rome in the second century AD. He was among the first and youngest to carve a niche for himself in Christianity in the eternal city of Rome, where he astounded his elders with his prodigious intellect and early development. Had his father, a high public official of pagan Rome, lived to guide his immensely talented son, things might have taken a different turn for the boy and for Christianity, but his widowed mother, the beautiful Anthia, had accepted Christianity with all her heart. It followed, therefore, that the boy's talents would be applied to Christian endeavour, and he was as quick to embrace the Messiah as he was quick to acquire knowledge. His enormous capacity for learning so accelerated his intellectual pace that he outdistanced his teachers, one of whom suggested to Anthia that she take this marvelous boy to the bishop of Rome, Aniketos, who after witnessing the boy's intellectual display took him under his personal supervision. With a desire to serve the Saviour that was as profound as his learning, Eleutherios embarked on a meteoric career as a man of the cloth, acquiring before he was twelve the equivalent of a college education and with such impressive credentials was tonsured a reader at the age of thirteen. When he was fifteen years old he was ordained a deacon and at the age of seventeen was ordained a priest of the Christian Church. With such early momentum propelling him and with an ever-increasing hope to serve Christ in the highest tradition of the apostles, he was elevated to the episcopacy at the age of twenty, the youngest bishop ever to reach that pinnacle through his own efforts. 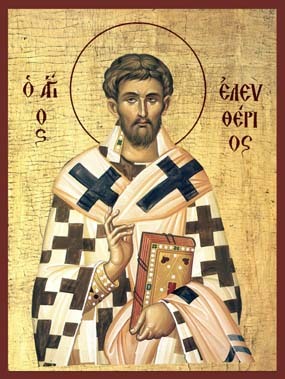 As bishop in Illyricum, Eleutherios promoted the cause of Christianity with the adroitness of a seasoned campaigner, giving added impetus to the Christian movement at a time when the merciless persecutions not only made it difficult to win and hold converts, but also at a time when the gravest danger was in being a high-ranking prelate of the Church. Oblivious to this threat, he was acclaimed in the inner circle of Christianity as the brightest luminary of Christian Rome since the apostles. Even those whom he failed to convert held him in the highest esteem, and with this immense popularity he grew bolder and thereby more offensive to the state. This outstanding theologian, orator and benefactor of Christian and pagan alike was finally mentioned to Emperor Hadrian, who ordered his arrest. Ordinarily the emperor would have questioned him personally because of his high station, but fearing a reprisal because of the prelate's popularity, Hadrian dispatched his most trusted centurion, a man named Felix, to bring the bishop before the prefect of Rome for trial and punishment. The centurion decided that rather than run the risk of seizing Eleutherios publicly he would seek out his place of worship and arrest him there. After some time Felix found the well-hidden church and crept in just as the bishop was commencing a sermon. The oratory of the brilliant Eleutherios was spellbinding, and when the sermon was over Felix came forth and asked to be converted to Christianity. This done, Felix exposed his purpose and apologised for having come to the house of God with treachery in his heart. He was easily forgiven by Eleutherios, who thereafter instructed the centurion to return him to the prefect lest judgment be passed on both of them. With a great deal of reluctance Felix took the bishop to what appeared to be a sealed fate, offering along the way to help Eleutherios escape. But the proud prelate would not hear of it. With the emperor conspicuous by his absence, St Eleutherios went on trial before the prefect, but not even his oratorical power could save him. The bishop was cast into prison, tortured, and put to death. He died for Christ on December 15.